There isn't a bar but I took a piece of rope and added clips to either end. 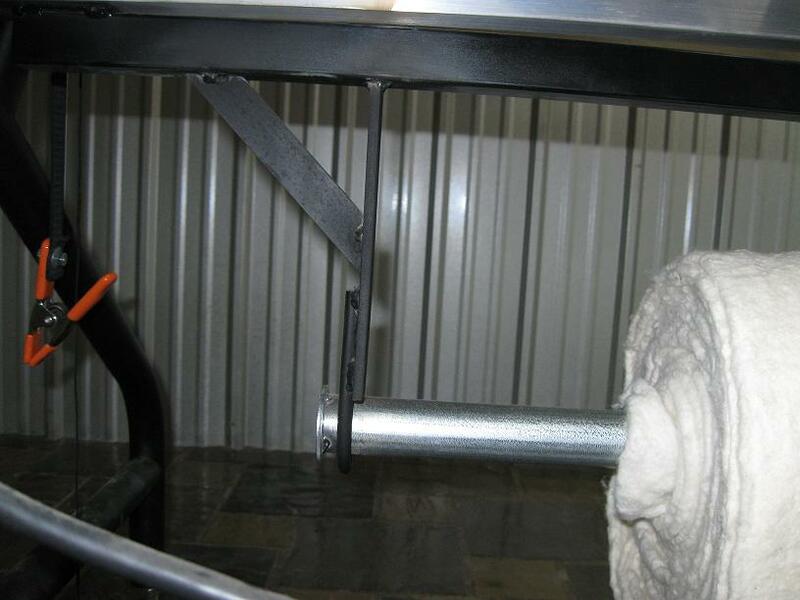 I can wrap it around the frame ends with no problem so I can store two rolls under my table and not on the floor. I store on the bar under the table, BUT every time I have to cut, I have to get down on my knees and I don't have a lot of room down there. I've stored some in a spare bedroom and when I cut I roll it out on the bed. When I have company, which is rare, I just stand the roll in a corner of the sewing room. I've noticed that if you stand them on the end, it's better to stand on the edge end rather than the fold end. The fold can become worn and mussed by the time you get to the end of the bolt. Hi Bonnie--since your batting roll is stored on a bar, have you tried pulling the end up through the rollers and standing while cutting your length? I use a flexible measuring tape to step out the amount needed, mark with blue marker where to cut, and use the roller to eyeball a straight cut. No crawling on the floor! Ikeep several rolls of batting on hand for my customers. If you have a tax-id, you can get the batting wholesale at quite a saving. Storage is a tough one. I can hold a regular batt (90" long) and a king batt on the roller under my machine. The batts are folded in half, like Boni mentioned but they can be pulled up and cut pretty easily the way Linda R (ffq-lar) explained. I have a batting storage solution that I have been nagging my DH about for months. So far, it is just a photo. I think this is from Vicki Welsh over on MQ Resource. This would be my cadillac of batting storage. Linda R. all I can say is, "Duh" Why didn't I think of that? You'd think after four years at this business it would have been a no-brainer. The only thing I can figure why I haven't done that, is USUALLY I load the backing, then cut the batting--which means my bars are all "busy" and I can't get the batting between them. Now a smart quilter would use the bars and measure and cut the batting FIRST! Boy, do I feel humbled. Ramona Quilter - I love the wall storage idea. I'll have to measure the closet and see if I can squeeze something like that in there. I know what you mean about getting your DH to build something. I find that if I start a project my DH will often take over and finish to keep me from making a mess of it. I'm afraid I would not have thought to measure through the bars either. Duh. I've crawled around on the floor under a friend's longarm to cut batting for a couple of years now, usually with two large curious dogs "helping". Edit, the closet rod holder was one that was made to hang down, not mount on the wall. another set of chains could be hung from that and another roll added. I'm considering hanging one over the seldom used end of the quilt room, at the end of the table. Won't be in the way yet will be handy to use. APQS does make a batting bar for the tables. I got one when I bought my Millie. It stores the roles fine but is rough bending down under the machine to cut. I wish I had the wall space for the rack. Connie, that's good to know. I'll have to ask about that when I schedule delivery. My storage space will be pretty limited so under that table will be a huge help. I hang my single roll from the ceiling on a closet pole with eye hooks in ea. end and the ceiling) and about 12" of chain from a swag light fixture. To cut, I roll down and measure (on the fold side) and pin on the the mark. I have a laser light that shoots a line (as opposed to a dot) from a bookshelf across the room. I align the pin and the laser line and cut. This can be tricky because the roll sometimes wants to be a race car so I always have 3-4 pins handy to secure it. The laser light keeps me from wasting batting due to wavy cuts! I forget where I saw the picture - but one gal stores all her rolls in the guest bath shower - & just moves them on the occasion she has a guest ............ me - no room for the rolls and use lots of different battings so I get the packaged batting and mist & throw in the dryer to puff them up and get rid of the wrinkles prior to loading - works great - plus gets rid of a bit of the shrinkage. Beth Durand stores her batting vertically on some sort of plant stands. I've been kicking around that idea since horizontal storage will take up too much room. I also like the idea of a bar under my table...its almost too efficient! If anyone is interested in buying a batting bar to put under their 14 ft. Milli table I have one for sale. Just give me a call. I have considered using additional closet poles inside the closet to hold rolls "stacked". I think in a closet with the wing doors that open and slide to the sides you could hang three rolls from the bottom up. 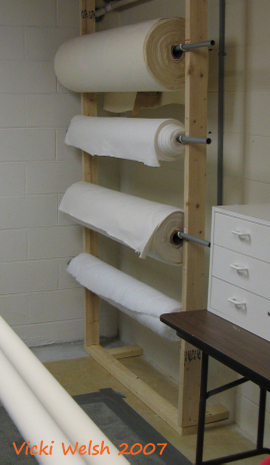 In a widder closet you might be able to hand 6 rolls in 2 columns. Just use the same method as the poles that hold clothing. I don't think rolls would be too heavy, I know clothes get pretty heavy an the poles can handle those just fine. What do ya'll think? I store my rolls a couple of ways. My room is 10 x 30, so it's tight. I used basic closet shelf brackets (the kind that hold the pole) and a floor storage thing, hard to describe, but it's like a vertical paper towel holder on wheels that I got from Checkers Distributors. Works great for the bamboo batting (since it's thin). Both systems were cheap. I use a lot of packaged batting and keep it on gorilla shelving that I got used. I saw this method a while ago, and it's nice and compact and easy to get to. You can get pre-cut circles of wood at Lowe's, Home Depot. Get a pipe flange in the plumbing dept for a 1.5" pipe. This is a thing you can thread a 1.5 threaded pipe into, and screw into the center of your board. Then get the pipe to match, 24" length is fine and screw it into the flange (any taller and you have to lift the batting too high to put in on). 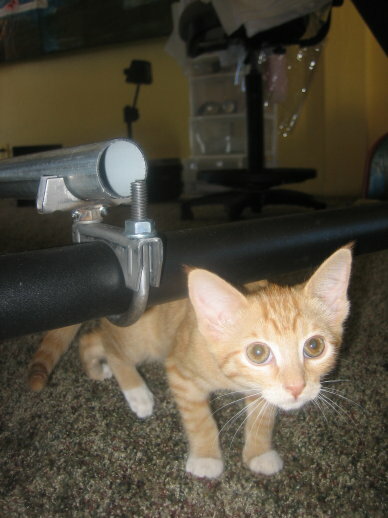 Then get some good quality casters so you can move this thing around. Although I don't do this, I saw a piece of elastic used to get the cut straight. I just hold the batting out from the roll and use a marker to draw a straight line. 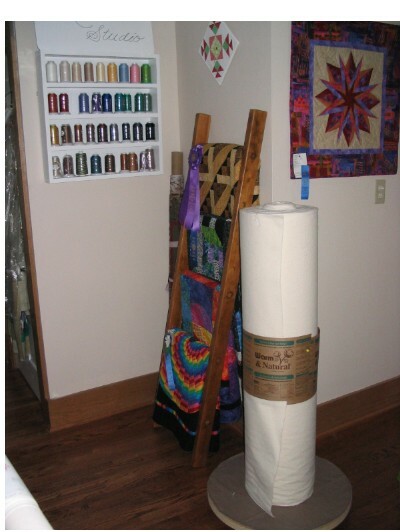 neat idea Caron - love the ladder in the photo with the quilts and ribbons too!!! Cute display!! Linda C - That is what I want someday too!! In a closet - so you can close the door..... when I am in "studio" instead of the living room!! Right now I have - 2 rolls under the machine on the bar (puffier stuff I don't use very often) 3 rolls standing behind my mahine, leaning on my customer quilt rack - for lack of a better place and method to deal with them.....I will show my husband the photos here - maybe we can do one of them - soon! Last but not least - both of my 80/20 (black and natural) 120" rolls of batting are on a pipe that used to be a flag pole by our mail box. It is hanging over the extra stairwell going down to the basement that has not been finished yet. New house, only been living in here 6 years or so.... can't rush into things!! That baby is a bit of a struggle to get a new roll on - I always wait for him to come home and help... I can just see me dropping the thing into the basement and having the batting un-roll EVERYWHERE!!!! bit scary really..... we do what works.
" ~ Aspire to Inspire before you Expire ~ "
This is what my DH made for me, the bolt on the end keeps for pipe from sliding out the end. The pipe is just the kind for chain link fence you can buy at Home Depot. I too was thinking that having the batting on a bar under the machine makes good sense, however, where would my co-worker "Buddy" sleep while I work?